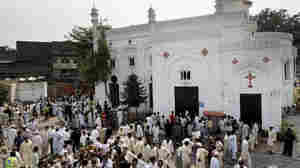 September 22, 2013  Two suicide bombers struck after a service at the All Saints Church in Peshawar, Pakistan, Sunday, killing more than 70 people and wounding more than 120, multiple reports say. The victims are believed to include children. June 25, 2013  The Taliban has claimed responsibility for Tuesday's assault in Kabul. 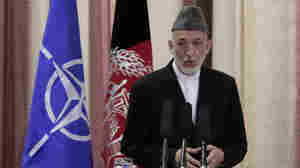 The attack raises questions about the chances for peace talks between that group and the Afghan government. 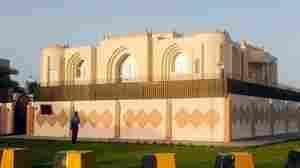 June 20, 2013  The Afghan government reportedly pulled out of talks because the Taliban used the name Islamic Emirate of Afghanistan on the plaque of its office in Qatar. It's not the only time disputed names have stymied diplomacy. We look at some past examples. June 20, 2013  U.S. officials promised to remove a nameplate and flag from the Taliban office in Qatar. 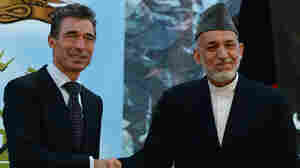 But the Afghan government remained furious and committed to staying out of the talks. 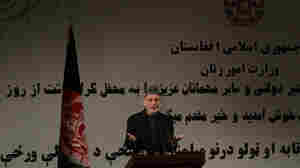 June 19, 2013  The developments cast doubt on the newly announced peace talks between the insurgents and the U.S.
June 18, 2013  In announcing a new political office in Qatar, the Taliban said it supports a peace process in Afghanistan. U.S. officials said they welcomed the development. June 18, 2013  It marks the first time the whole country has been under Afghan control since the coalition invaded to oust the Taliban in 2001. 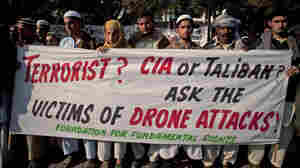 May 29, 2013  Pakistani officials say Waliur Rehman was killed by a suspected U.S. drone strike. The U.S. has been offering a $5 million reward for information about him. Rehman is said to have been involved in a 2009 attack that killed seven Americans in Afghanistan — the worst loss of life in CIA history. April 27, 2013  The militant group says it will use "every possible tactic" to inflict casualties on foreigners in Afghanistan. They specifically mention insider attacks, a growing threat in recent years. Taliban attacks are up nearly 50 percent compared to this time in 2012, an independent report says. March 10, 2013  The allegations come as Defense Secretary Chuck Hagel continues his first visit to the nation as Pentagon Chief – and after a deadly explosion in Kabul on Saturday that the Taliban called a message to the new defense secretary. February 4, 2013  Malala Yousafzai was shot by the Taliban in Pakistan last October because she had been speaking out about its attempts to block Pakistani girls from going to school. Now the teenager is in England, where she continues to recover from her injuries. Her "Malala Fund" aims to help girls get educated. 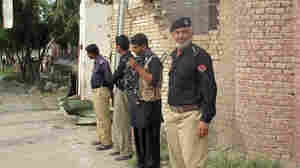 February 2, 2013  Armed with rocket-propelled grenades and automatic weapons, militants attacked an army camp in Northwestern Pakistan early Saturday.